Di-Spark Ltd have been awarded Certified Supplier Status by Meggitt Avionics. This award was received as Di-Spark Ltd has demonstrated the ability to consistently supply on time, reliable quality product. 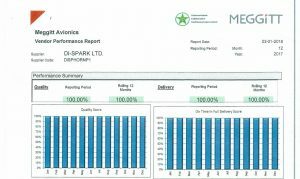 Di-Spark achieved 100% OTD and 100% Quality stats over a period of 12 months.